This article is about the 1941 film. For the unrelated 1985 novel by Kay Thorpe, see Dangerous Moonlight (novel). "Suicide Squadron" redirects here. It is not to be confused with suicide squad. Dangerous Moonlight (also known as Suicide Squadron in the USA) is a 1941 British film, starring Anton Walbrook, best known for its score written by Richard Addinsell with orchestrations by Roy Douglas, which includes the Warsaw Concerto. Among the costumes, the gowns were designed by Cecil Beaton. The film's love-story plot told mainly in flashbacks, revolves around the fictional composer of the Warsaw Concerto, a piano virtuoso and "shell-shocked" combat pilot, who meets an American war correspondent in Warsaw, and later returns from America to join the RAF in England to continue to fight against the Germans and their occupation of Poland. During the German invasion of Poland, Polish airman and piano virtuoso, Stefan Radetzky (Anton Walbrook) meets American reporter Carole Peters (Sally Gray). He volunteers to fly a "suicide mission" against Germany, but is not selected. Radetzky is among the last to escape Warsaw and months later, in New York, he and Carole meet again, and marry. In England, Radetzky gives a public concert and reveals that he has come back to fight, volunteering to fly as a pilot in a Polish squadron, fighting in the Battle of Britain, even though Carole fears he will be killed. His final mission ends with him sacrificing himself, crashing into a German aircraft. He survives the crash, but is badly injured and suffers from amnesia. Some while later, Radetzky is in a London hospital, recovering from his injuries. He begins to remember his past, recalling composing the "Warsaw Concerto," while Germans bomb the city, and when he first met his wife. Sitting at the piano, Radetzky sees Carole and says, "Carole, it's not safe to go out with you when the moon is so bright", repeating the first words he ever spoke to her. In a key scene, Radetzky plays his composition, Warsaw Concerto for Carole Peters in the midst of a ruined city. The scene was reminiscent of actual events in Poland at the time. Dangerous Moonlight was produced by the British unit of RKO, which financed it. Since music was such a key element in the film, Walbrook, who was an accomplished amateur pianist, is seen playing in the film, although the music on the soundtrack is played by the professional pianist Louis Kentner. Kentner's involvement was initially uncredited, as he thought that being seen to be playing film music would not help his career. He changed his mind on seeing the film's success. Aerial scenes were actually filmed in combat and feature the No 74 Squadron (Squadron lettering "ZD") Supermarine Spitfire fighters that flew in the Battle of Britain. Released initially in the UK as Dangerous Moonlight, it was a box office success in Great Britain, although contemporary reviews were generally unfavourable, with The New York Times in its review, noting that it was "... mainly ... a sentimental fable in which the excellent Anton Walbrook, so eloquent as the Hutterite leader in "The Invaders," and Sally Gray make a listless and anemic pair of lovers. Derrick De Marney does much better by the roguish character of an Irish daredevil. None of them has lifted the film above the level of a hackneyed fiction." Dangerous Moonlight was a melange of art and warfare, with the best-remembered scenes involving the Warsaw Concerto, composed by Richard Addinsell, one of the most beloved classical pieces that emerged from the period. Walbrook was not pleased with his performance and considered the film his least favourite. 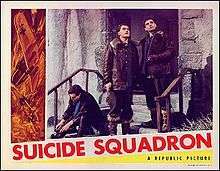 When released in the United States, the film was renamed Suicide Squadron in a slightly abbreviated 83 minute version, and distributed by Republic Pictures under lease, although its UK release was through RKO Radio British. Despite relying heavily on its film music, Variety noted that the sound quality was noticeably poor, especially in early scenes, although the aerial sequences, however, were particularly effective. The Dangerous Moonlight is mentioned in the British television series Dad's Army episode "Is There Honey Still for Tea? ", an in-joke as John Laurie had featured in the film. Theirs is the Glory. Arnhem, Hurst and Conflict on Film takes film director Brian Desmond Hurst's Battle of Arnhem epic as its centerpiece and chronicles Hurst's ten films on conflict including Dangerous Moonlight. Released in hardback on 15 September 2016 with almost 400 pages and over 350 images "this book also shows why Hurst was an enigma, but a master of the genre, and at his very best when focusing on the vast canvas of film" (from dust jacket). ISBN 978-1-911096-63-4. Publisher Helion and Company and co-authored by David Truesdale and Allan Esler Smith. 1 2 3 Jahiel, Edwin. "Dangerous Moonlight (UK, 1941)." Movie Reviews by Edwin Jahiel. Retrieved; 7 May 2012. ↑ "Credits: Dangerous Moonlight (1941)." IMDb. Retrieved: 7 May 2012. ↑ "Dangerous Moonlight". BBC website. Retrieved: 7 May 2012. ↑ "Notes: Suicide Squadron." Turner Classic Movies. Retrieved; 7 May 2012. ↑ T.S. "Movie Review: Dangerous Moonlight (1941), At Loew' s Criterion." The New York Times, 14 May 1942. Retrieved; 7 May 2012. 1 2 Parish 1990, p. 388. ↑ Cross, Brenda. "Interview with Anton Walbrook." The Picturegoer, 14 February 1948. Retrieved: 7 May 2012. ↑ "Leonard Maltin Movie Review." Turner Classic Movies. Retrieved; 7 May 2012. Parish, James Robert. The Great Combat Pictures: Twentieth-Century Warfare on the Screen. Metuchen, New Jersey: The Scarecrow Press, 1990. ISBN 978-0-8108-2315-0.